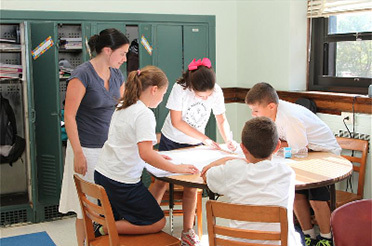 Our parish school is a community that nourishes the faith of our young students and their families. Truly, our school is a vital ministry of the parish seeking to pass the traditions of our faith, most especially in the celebration of the weekly Sunday Mass. We treasure this parish ministry as it responds to the command of Jesus "to let the children come to me." Saint Anne's school educates children in a Roman Catholic community dedicated to having our children develop a meaningful relationship with our loving God: to know Him better - to love Him more deeply – and – to speak to Him more consistently. We incorporate our religious focus with a rigorous academic curriculum and nurturing classroom environment to provide each student a challenging educational experience which will prepare them for a successful future. On February 26, 1950, Fr. Eugene McCloskey, third pastor of St. Anne's, directed the "groundbreaking" ceremony for Saint Anne's School. On that cold day, about 150 students and their parents watched with pride, as another milestone in the history of Saint Anne's Parish was reached. By February 1951, the school was ready to open. Six sisters of the Religious of the Sacred Heart of Mary, an international order of religious women founded over a hundred years ago, were ready for the challenge of more than 400 students who had registered for Kindergarten through sixth grade. The Religious of the Sacred Heart of Mary continued to direct and staff the school for the next fifty years. With the guidance of pastor Msgr. 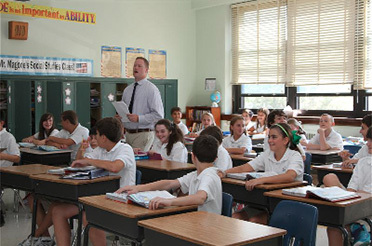 John C. Seidenschwang, Saint Anne's was the first Catholic elementary school on Long Island to seek and receive accreditation from the prestigious Middle States Association of Schools and Colleges in 1991. The Saint Therese Chapel, dedicated to Msgr. William Costello, was designed and built under the leadership of pastor Msgr. John Gilmartin, strengthening the focus on faith for our school community with weekly class Masses for each grade. A science lab, resource room services, and extensive capital repairs were important improvements during these years. Today, Principal, Mr. Gene Fennell and a well-qualified faculty and staff join our Pastor, Monsignor Thomas Harold, an advisory School Board, a supportive Home School Association and highly motivated students and parents to form a vibrant school community. 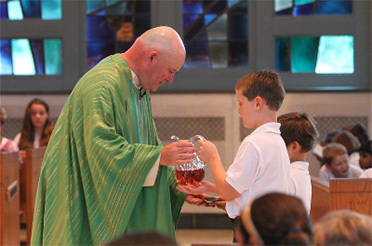 As a ministry of our parish, Saint Anne's School is dedicated to helping each child feel God's presence and love, recognizing that the sascramental life is essential to our personal growth. Children are encouraged to demonstrate Catholic values through service to those in need. Our enrollment continues to be a strong indicator of success and we look forward to continuing to provide an exceptional Catholic elementary education at Saint Anne's School.